Two women are seen standing, engaged in conversation. First woman: My heart is open. I have no prejudices. I tolerate you! 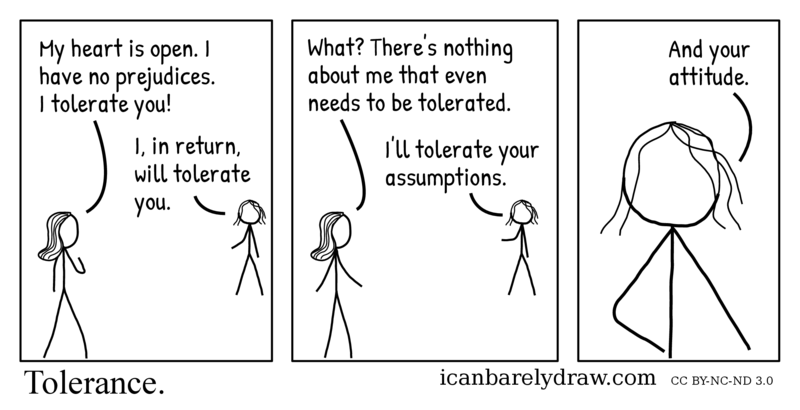 Second woman: I, in return, will tolerate you. The second panel shows the same two women again. First woman: What? There's nothing about me that even needs to be tolerated. Second woman: I'll tolerate your assumptions. The third and final panel shows only the second woman, in a closer view. Second woman: And your attitude.